I had only been in Shamwana, Democratic Republic of Congo (DRC), for two months when it was decided that we would be handing over the running of the hospital to the Ministry of Health. Médecins Sans Frontières/Doctors Without Borders (MSF) had been working in Shamwana for 10 years, supporting the Ministry of Health hospital as well as seven surrounding health centres. In cooperation with the Ministry of Health, our teams provided primary and secondary health services. These include the treatment of: malaria, diarrhoea, malnutrition, respiratory tract infections, HIV/AIDS and tuberculosis (TB), as well as surgical, reproductive and mental health services. I was the technical logistician for the project (often known as the ‘tech-log’), which means that, among other things, I had responsibility for the energy system for the hospital. Shamwana is an extremely off-grid location with no transport access during the rainy season. The main challenge was that the hospital had to have electricity for lights, medical oxygen, and to operate a cold-chain. Many medications have to be kept cool in order to be effective, which means finding ways to keep them refrigerated, even in hot conditions like Shamwana – this is what's known as the ‘cold chain’. The current energy supply system completely relied on continuous shipments of diesel – approximately 1,000 litres per month. We very quickly concluded that this would not be sustainable. However, inspired by the dedication of the Ministry of Health staff — most notably the hospital director Dr Daddy —we searched for solutions to leave the most sustainable system in place. Although Shamwana has no mains electricity, the sunshine is nearly endless and quite reliable. I started to design a solar energy system. This was my first assignment with MSF, and I had never done a completely stand-alone off-grid solar power system. But back home I had worked a little bit at the research institute in Sweden to integrate solar panels in building design, and luckily my colleagues there were willing to help me with the very first estimates on what we would need. This was in May, and the handover of the hospital was planned for the end of August. Luckily we had some equipment in the project that could be reused. 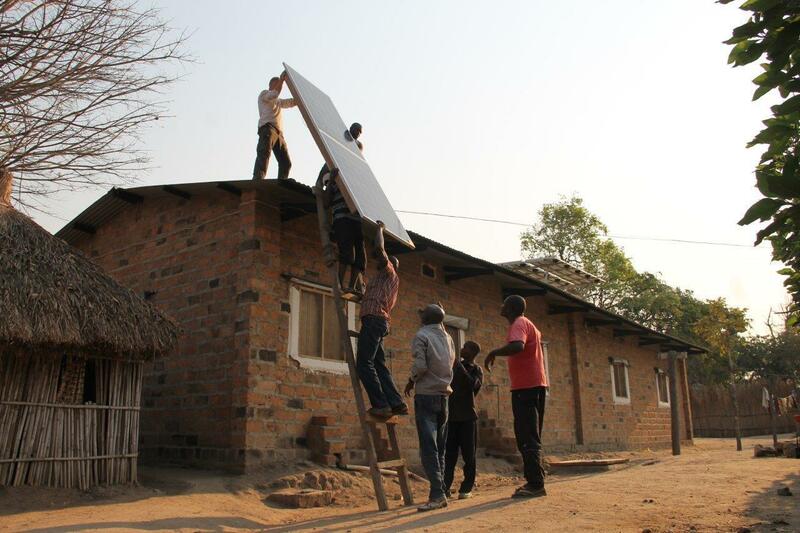 We managed to get some of the solar panels at a very low cost from an earlier batch donated to MSF by a manufacturer. So gradually, this really high-odds idea turned into a go-ahead, which really made my last months in Shamwana worthwhile. In a race against time, a feasible solar power system was designed that will be able to power lights at night-time, some medical equipment, and most importantly - one oxygen concentrator to run non-stop every day. The production of medical-grade concentrated oxygen is vital for many patients with respiratory diseases, particularly for newborn children and during surgery. This is highly energy-consuming: to run just one of the concentrators continuously requires twelve large solar panels and twelve batteries. Making sure we could do it was the biggest challenge of the whole project. There were moments of despair. The time-frame was extremely short in all respects and particularly since it involved getting the equipment from overseas. Although we made the decision to build the system in May, it was not until one week into July that the last pieces of equipment were ready to be shipped from Amsterdam – just over a month before the handover of the hospital and only seven weeks before we were supposed to finally leave Shamwana. It was tight, but the installation work went better than I could ever have imagined. It took just two weeks for the fantastic assistant tech-log and electrician Jean-Murck, together with Pablo, the mission electrician, to rewire the whole electricity system of the hospital to the new limited layout. So finally, to my surprise, we had he whole system up and running on the day of the hospital handover. I was very, very proud that day! The evening before we had switched on the first part of the system and we could really say that the hospital was operating on solar power. Compared to the former system, the capacity is roughly one-third. The solar panels finally installed! As well as the panels and batteries needed to run the oxygen concentrator, an additional four panels and four batteries have been installed to power the rest of the equipment. This makes it a fairly large installation in total, with a maximum power production of close to 4 kW. In addition to this, we kept the current system for supplying the electric water pump and installed a new solar fridge. Now that the handover is complete, we all wish the Ministry of Health and the population of Shamwana strength, courage, and a lot of sun!